They say that one of the first signs of insanity is the belief that one can somehow influence completely random events. I will stand in exactly this spot with my feet angled at 45 degrees, and when the subway stops the doors will line up with my feet and I will get on first, and perhaps get a seat - that kind of thing. Game 1 (Yankee Stadium) - I brought a 6-pack of Weihenstephan weiss bier, or wheat beer, to a friend's house. The beer is excellent - fruity, clean, thirst quenching, bitter and sweet at the same time. The Yanks play well, the Angels play poorly and make key errors, Yanks win. Game 2 (Yankee Stadium) - I bring a bottle of Claux Delorme to another friend's house. We decant it, it's delicious. When it's gone we enjoy the previous night's leftovers - 2002 Stony Hill Chardonnay. The game goes into extra innings, and we drink a 375 ml of 2003 Suduiraut Sauternes. The Yanks dramatically tie the score in late innings during the Stony Hill, and win a thriller in the 13th inning. Game 3 - (Anaheim) - I have the remnants of a cold, I stay home and listen to the game on the radio (we are prehistoric and do not have a television), I drink nothing. The Yanks waste a great pitching performance by Andy Pettitte and lose a game they could have won - key mistakes killed them. Game 4 - (Anaheim) - I again bring a bottle of Claux Delorme, this time to a third friend's house. We begin by drinking his 2007 Pinon Vouvray Silex Noir leftovers, and then drink the Delorme, again, just delicious. The Yanks dominate the Angels, winning 10-1. Game 5 - (Anaheim) - I go back to game 2 friend's house. Deetrane comes over too. I bring Delamotte Brut Rosé Champagne and we drink it as the Yanks quickly fall behind by 4 runs. My friend opens a 1995 Château Lafon-Rochet, from St. Estèphe. I'm skeptical of all things Bordeaux, but the nose is really lovely - very pure, which is not what I've come to expect. Bright red fruit on a cedar plank, vibrantly perfumed, really enticing. The palate is not as strong, a bit dilute in the middle and just not all that complicated, but at least it's not some spoofed up fruit bomb. Very drinkable and pleasing indeed. The Yanks stage a dramatic rally and take the lead in the 7th inning. The pennant is immanent. We finish the Lafon Rochet and Deetrane opens up a 2002 Panther Creek Pinot Noir Bednarik Vineyard. It's fine, but too much on the cherry cough syrup tip. The Yanks lose the lead, and then the game. So what, I ask you, should I bring to my Bordeaux-loving friend's house tonight for the terribly important game 6? Suggestions welcome, although they will be Monday-morning -quarterback suggestions, as you'll probably read this Monday morning. Suggestions welcome anyway, and I'll let you know what we did tomorrow in the comments. It's natural to overlook Champagne Delamotte, as its superstar sister Salon gets most of the attention. And like many whose siblings have attention-grabbing personalities, Delamotte wines are of the quiet type. They don't show particularly well at big tastings, at least in my experience, where the loudest wines draw the crowds. But as an apértif with friends or at the table, these wines are surprisingly lovely. This post is in part a tribute to Peter Liem and his recently deceased blog Besotted Ramblings and Other Drivel. I don't know this for sure because we've never discussed it, but I imagine that Peter would like these wines, particularly the one I drank the other night, a gift from my friend Tista (who I met through Peter), the NV Delamotte Brut Rosé, about $55, Wilson Daniels Imports. Peter would like this wine because it smells and tastes great. Period. It is not a super-cool skateboarding and mussy-haired hipster Champagne, it doesn't appear on the list at any of the hottest Paris bars, or at Terroir or Ten Bells. The wine maker did not grow the grapes or spray them with biodynamic treatments, and there are no former-bankers turned hippie horse farmers involved in any way with the production, importing, or distribution of this wine. Many of the wine cool-cats would say, then, that Delamotte Rosé isn't worth drinking, or at best would simply ignore it. And this is one of my favorite things about Peter Liem as a wine writer - he thinks about and writes about wine based on merits, not based on hipster caché. Some of the wines he loves are cool-cat wines, like Overnoy/Houillon, La Bota Sherries, and Vouette et Sorbée, but he also likes decidedly un-hip big house wines, négoce wines, and anything else that speaks to him. And if you don't think that's cool, that's your problem. I'll miss his blog very much, but there are other ways to follow Peter's wine writing, praise be. The NV Delamotte Brut Rosé is a saignée wine. That's cool, isn't it? So is Vouette et Sorbée, so they have that in common. It is 80% Pinot Noir, the rest Chardonnay. It needs a half hour or so to open up, and then the fresh red berry aromas become quite vivid, the nose airy and fresh. It is elegant and balanced on the palate, without sacrificing the energetic exuberance of a good saignée. The fruit is ripe and there is a tender chalky and floral fragrance on the finish. We loved it, and I look forward to serving it blind the next time I am hosting a Champagne-loving uber-hipster. Last week we had nasty, windy, rainy, bitingly cold weather in NYC. It inspired me to do some winter cooking, a delicious and very satisfying beef braise. For the very first braise of the season I like to keep things extremely simple. High quality beef and vegetables, wine and stock for the liquid, a low temperature oven for many hours, and that's it. So I started with my favorite grass-fed, hormone and antibiotic free beef from Slope Farms, in this case, a couple of pounds of chuck roast. Trimmed, salted 24 hours in advance, brought to room temperature, and then browned. Then a lot of finely chopped onion, and a glug of white wine to loosen the browned bits on the bottom of the pot. The browned beef comes back, along with thick carrot rounds and an entire halved garlic clove, both from Maxwell's Farm in New Jersey. In goes a mixture of more white wine and stock, enough to come about three-quarters of the way up the sides of the beef. Once the liquid comes to a boil, I lowered the heat and added three whole cloves and about 6 black pepper corns, top the pot with moistened parchment paper and a tight-fitting cover. One whole Serrano pepper pricked a bit with a fork is wonderful too, but makes it too hard for my little daughters. Two hours at 275 degrees, remover the cover and the parchment paper and let it go another two hours. Add salt to taste, and that's it. Many meals are possible here. I shread the cooked meat and use it in sauce for pasta (think Orchiette with brown butter, turnip greens, shredded braised beef and lemon zest). Flour tortillas, green chili sauce, avocado, limes, and shreds of this braised beef make a pretty good meal too. On the night after the night of this first braise (the flavors improve in the fridge overnight), we enjoyed it in its most basic form - a hunk of braised beef, a few carrots, the strained braising liquid, a crusty baguette, and a green salad with a bright vinegary dressing. A beautiful bottle of Gonon Syrah from the hills outside of St Joseph, and I no longer fear winter. A friend recently hosted his tasting group and invited me as a stand-in. They were blind tasting 2004 white Burgundies, a great theme in and of itself. A difficult year in most of Burgundy, particularly for red wines. How would the whites show five years on? But the group added a fascinating wrinkle to this tasting. In addition to writing notes about each wine, we would also assign each wine a point score using a version of the 100 point scale. The idea was to test the notion that wine can be numerically rated in a reliable and sensible manner when tasting many of them somewhat quickly. There were 7 of us participating, we each brought one wine, all of the wines were served blind. Would the "best" wines get the best scores? Or would our diverse palates and preferences lead to unpredictable or inconclusive results? We first spent some time discussing how to rank the wines. We agreed on the following method: 96-100 is a wine that is the very best of its class, and therefore quite rare. 90-95 is a wine that is exceptional, worth seeking out and buying. 85-89 is a very good wine, 80-84 is a good wine, and 79 or below is not good. We agreed not to discuss during the tasting, and we got to work. I tasted in reverse order, and I'll share my notes before revealing the wines. Wine 7) Creamy leesy lemon cake icing, smoky. This is super extracted and huge, not a style that I care for. But it's not bad wine, there is a mineral character, and it is actually somewhat balanced considering that it seems to be going mostly for power and muscle. Showy, not elegant, but well made, and within that style it is very good wine. I scored it an 88. Wine 6) Mushroomy earth, smoky, very mineral, delicate citrus on the nose - a gorgeously expressive nose, airy and elegant. Great texture - ample and tactile, graceful. Purity, ripe fruit, great length, piercing flavors and acidity with a perfumed finish of herbs and flowers. This wine has great core intensity without being overly extracted or ripe. I thought it was beautiful and exceptional wine, something I wanted to seek out and buy. Not at the top of that category, but not at the bottom either, so I scored it a 92. Wine 5) Nose is mute, perhaps some minerals are hiding somewhere in there. Kind of flat on the palate too. Certainly correct wine, some citrus, some minerals, austere, good balance. But unexciting. I got involved in conversation and sat there swirling this wine for a few minutes, and this is why this whole point thing is precarious, at best. What if the critic stops here and doesn't re-visit the wine, moving instead through the remaining 35 glasses that require tasting? Five minutes later this wine was beautiful and very expressive, with deliciously clean and pure notes of citrus, stones, and flowers. Great understated acidity, great balance, and a lovely lingering perfume, this is great wine, absolutely delicious, and with an elegant and understated character. I preferred Wine 6, but if money were not a factor I would eagerly buy this wine also. I scored it a 91. Wine 4) Reductive nose that required serious aeration, and then there is a whole lot of oak. This is not an appealing nose to me. The palate is better, with some citrus and mineral flavors, but there is nothing complex about this wine and it is kind of thin in the mid-palate. It is perfectly good wine, but I found it hard to get by the nose. I scored it an 84. Wine 3) Reduction on the nose, again lots of aeration needed, but then reveals a lovely and focused nose of minerals, very clean and pure, with ripe but delicate citrus fruit. Good balance, a soft and almost plush texture that is lifted by good acidity, lovely herbal notes on the finish. Excellent wine, worth seeking out and buying. Without the same intensity of Wines 6 and 5, and with a bit more fat, but excellent nonetheless. I scored it a 90. Wine 2) I thought this was flawed. Not corked, but completely wrong. Heat damaged maybe? I got nothing but resin and rubber tires on the nose, some rotting leaves. And it tasted awful too. I wasn't sure how to score flawed wine, so I gave it a 79. Wine 1) Reductive nose, took longer than seemed reasonable to blow off - I had almost given up. But it did blow off, and revealed elegant airy mineral and herbal aromas. An intense core of lemon on the palate, good length. This is very good wine, but it is not entirely harmonious, it seems kind of herky-jerky to me. I scored it an 88. Wine 7) - Hubert Lignier Fixin - 86.2 avg., 88 my score. Interesting results, I think. The wines showed very well overall, I would say. I was secretly gratified that my scores were in line with the relative nobility of the various terroir - I scored the Pulignys the highest, then the 1er Cru from Saint-Aubin, and so on, the Bourgogne lowest. Not that this should always be the case, but it felt right to me looking over the wines. It is also clear that subtle wines can be underrated in tastings like this - the Pernot wine is a good example. Also, to my astonishment, some people liked Wine 2! Half of us thought it was flawed, and some liked it, and that shows how fallible point scoring can be. If one critic is responsible for assigning a score, that person might like wines that I don't, or vice-versa. I don't think our experiment broke any new ground, but it reminded me that the only way I find point scores useful is when I know and trust the scorer, and when I know the details about where our palates intersect and where they do not. I'm one of those weirdos who likes Gewurztraminer. It's true, so many of the wines are very bad - sweet and unbalanced, too viscous, devoid of subtlety, crude. But there are good versions out there, and they get lost in the shadow of badness. I understand Gewurztraminer, like Muscat, the way they relate to the other white Alsace grapes. In general, Gewurztraminer and Muscat make aromatic wines, whereas Riesling and Sylvaner are more mineral, and Pinot Gris and Pinot Blanc are more about fresh fruit. None of these general descriptors indicates anything specific about sweetness. Alsace producers make dry, off-dry, and sweet wines from all of these grapes, yet the average Gewurztraminer seems to be too sweet. Aromatic doesn't have to mean sweet, though, and my favorite Gewurztraminer wines are dry, or at least they don't seem sweet because they are balanced by good acidity. Truth be told, I haven't found many that fit this description, but those I've found, I love: Dirler's and Binner's particularly. I haven't tried Boxler's, but I bet it's very good too. The other day I found another one, by a producer I'd never heard of, Helfrich. Full disclosure- this wine, along with several other Helfrich wines, was sent to me as a sample by a firm representing Underdog Wine Merchants in California. A friend came over the other night and after dinner we served an Alsace cheese called Le Welsche, a washed rind cow's milk cheese in the Munster family. This particular cheese is washed with Marc de Gewurztraminer. I always thought Marc was a kind of Brandy, but it isn't (thank you ChampagneGuide.net blog) Marc, like Grappa, is a distillation made from leftover grape skins, stems, and seeds (called pomace), Gewurztraminer pomace in this case. We unwrapped the cheese a solid two hours before eating to let it air out and come to room temperature. It is not a runny cheese like Epoisses, but is is soft and easy to spread - we went with thin slices of a seven-grain loaf. Le Welsche is not on the stinkiest end of the washed rind cheese spectrum, but it has a pungency that harmonizes well with its grassy sweet cream. The pairing was great, and that's probably why it's a classic. The 2005 Helfrich Stenklotz Grand Cru Gewurztraminer, about $23, Imported by Underdog Wine Merchants, is a great wine, and a great value. Steinklotz means "stony block," and Helfrich's plot is calcareous bedrock covered in about 8 inches of loamy topsoil. This mineral character really comes through in the wine. The nose shows pure springwater and rock, and also classic aromas of exotic fruit and spice, but it is an elegant expression, not some sort of opulent explosion. The minerals continue on the palate, which comes across as dry, although there are 21 grams/liter of residual sugar here. That's well into demi-sec territory by Loire Chenin standards, and like the best examples of demi-sec Vouvray, the sweetness here is balanced by superb acidity. This wine is defined by its balance - it feels completely unadorned. It is only 13% alcohol, it is highly aromatic, especially on the finish, but it isn't sweet. It is full in body, but not viscous, it is very pure and almost cutting in its minerality, and the whole package is seamless. I would eagerly buy this wine, and probably lay down a few bottles too, but it is not available right now in NYC. A simple web search reveals that it is available in California, Colorado, and New York state, and it's probably available in other markets too. I still haven't sprung for the good version of wine location software. If I were putting together a Noah's Ark of wine, Jean Foillard's Morgons would represent the Beaujolais species. There are many lovable Beaujolais wines, but I love these the most. And it's funny, because Foillard's wines are not, in my experience, all that lovable upon opening. They can be a little gassy at first, also showing some reductive aromas until the wine meets up with some oxygen. But when a Foillard Morgon opens up, it can be a very beautiful thing. The fruit is joyous and lovely - this is true of most good Beaujolais wines. These are complex and well balanced wines too. But the things that defines Foillard's wines for me is the way they combine such incredible clarity with such rich intensity. Morgon is considered by many to offer the greatest potential of the 10 Beaujolais Crus. 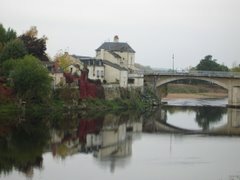 The Côte de Py is the most renown site in Morgon. It is a large hill with soils of schist and granite, an extinct volcano actually, as I learned from Bert's post on Wine Terroirs. Foillard has plots on the Côte de Py, and also in another Morgon vineyard called Corcelette, a plot with sandy soil, as I learned from Peter Liem's post (the comments explain this). I don't know the age of Foillard's vines in Côte de Py, but his vines in Corcelette are about 80 years old. The Côte de Py is pretty easy to find in NYC each year, Corcelette is more difficult. Both wines are delicious young, but they have a reputation for aging particularly well. A friend came for brunch last weekend and one of the wines we drank was the 2007 Corcelette. And if you have a problem with the fact that we opened several bottles with brunch, I really just don't know what to tell you. We didn't finish what we opened, but when you have the chance to drink wine with a fellow wine lover, why not explore a few bottles together? We both loved the Corcelette, and he wasn't around later that evening when the wine hit a crescendo. It was so good that I felt compelled to open the 2007 Côte de Py later in the week, just to see how it would compare. It was also fantastic, but in a different way. The wines are quite obviously sisters, but they offer a different expression of Morgon Gamay. The fruit is vibrant in the 2007 Foillard Morgon Corcelette, $29, imported by Kermit Lynch Wine Merchant. The acidity is vibrant too, and the wine feels tactile in the mouth - crunchy almost. This is cooling and floral raspberry fruit, smooth and velvety, and there is a gorgeous fragrance on the finish. After several hours open, this wine was remarkable in its old vines intensity - the nose just builds and builds and builds, and the pure fragrance of slightly herbal ripe fruit fills every crevice in the mouth after swallowing. Such a beautiful wine! I'd rather spend my money on this than Bourgogne rouge. The 2007 Foillard Morgon Côte de Py, also $29, wears its structure more overtly, its deep cherry fruit corralled by iron and rock. The fruit is spicier and more mineral infused than the Corcelette, meatier. The texture here is also velvety smooth, but even after a few hours the structure is still as prominent as is the fruit. This wine is more steak and potatoes, and the Corcelette is more warm raspberry pie. I suspect that the Côte de Py, although delicious now, will be more harmonious in a few years. Fall is tasting season in New York. This year it has been a bit more subdued than usual, perhaps because no one has any money. But still, there have been plenty of trade tastings to attend. I went to almost none of them. Some, like Jenny & François, I wanted to attend but missed because of work conflicts. Some I skipped because I went in years past, and couldn't muster up the gumption to fight the crowds for a loud and jostly ounce, even if it is Dujac Morey St Denis. But I made a point of going to a couple of tastings that I'd never before attended. This is one of my favorite ways to discover producers and wines - to try something new. This year, for example, I went to the Willette Wines portfolio tasting. Liz Willette has a small but interesting group of producers, and she works with Becky and Peter Wasserman, so she must be a good person. At this tasting I drank some great wines that were completely new to me, wines that I will happily buy if I see them in stores. Have you had Godmé Champagne? I had heard of it, but never tasted, and I was very impressed. The Godmé estate is located in Verzenay, the Grand Cru village in the Pinot Noir belt of the Montagne de Reims. Another small but excellent producer is there too - Lallement. Anyway, I liked these wines because they had such clean and pure flavors, and a great elegant intensity. The NV Godmé Brut Réserve 1er Cru should sell for about $50, and I thought it was excellent. The nose is airy and fresh with lovely floral aromas - my notes say chamomile. Not a profound wine, but very well textured and open, and the finish has orange peel notes that are very pretty. 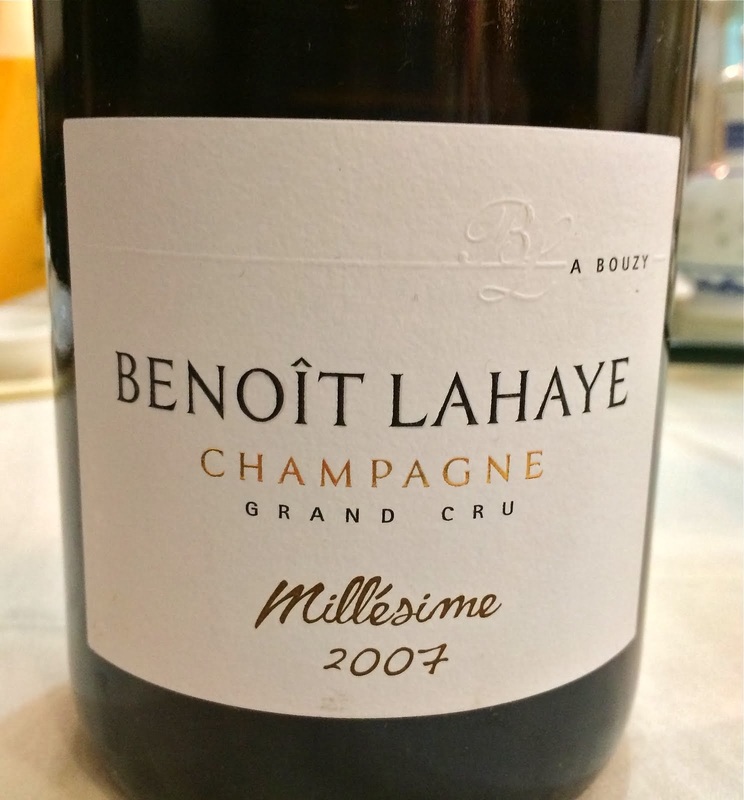 The NV Godmé Brut Tradition Blanc de Noirs should sell for about $55 was a much more serious wine, full of dark furry fruit and black tea, very wound up and tense. I liked it but would need to drink it at home to get a better sense. The NV Godmé Brut Rosé, about $60, is somewhat shy, but that's fine - aerate a bit and it shows a beautiful perfume of peaches and spice, raspberries and chalky soil. It is a serious wine that is also quite joyous. The other wines that floored me were the Camille Giroud Burgundies. I always thought of Camille Giroud as old-men-in-tweed-blazers Burgundy. But the family sold in 2001 to a group that included a bunch of investment bankers from Goldman Sachs (!). Becky Wasserman is involved as a manager of some sort, and the young buck David Croix is the head wine maker. I must say, the 2006's were delicious. My particular favorites were the two "low level" wines, the 2006 Camille Giroud Bourgogne Rouge, about $26 and the 2006 Camille Giroud Aloxe-Corton 1er Cru Les Guérets, about $37. Of course the Volnay Taillepieds was very good, and so was Pommard Epenots, but those are much more expensive, and they weren't as easy to understand at this tasting. The Bourgogne Rouge was enticing and delicious, meaty and floral, like a Volnay. And whaddaya know, that's where some of the parcels are. Good balance, absolutely tasty and satisfying, a great Bourgogne. And this is coming from a person who has issues with Bourgogne Rouge. But the gem of the portfolio, QPR-wise anyway, is the Aloxe-Corton. It is a wine that is unmistakably of its place - masculine, the tannins tough, the fruit deep and dark, a brooding earthy pungency already starting to show. But like all good versions of wine from this place, this wine also has a gentle side. It is refined and well balanced, and I found the overall package to be incredibly sophisticated. I would eagerly buy this wine, and I'm sure it would cellar well but I bet I would drink mine rather quickly, fall coming on and all. It took me quite a while to try ZuZu Ramen. And I love ramen, really and truly. There are two things that kept me away all this time. First of all, it's not Japanese. The place is owned by the people who own Sheep Station, an Australian-themed joint a block away. Okay, the head chef is Japanese, but he comes from illustrious French kitchens like Jean Georges. I don't know...I would feel equally strange going to eat sushi at a place owned by an Armenian couple, or to have Doro Wat at an Italian restaurant. It's possible that the food is going to be great, but as long as I'm in NYC, it seems as though there are more more reliable options for authentic food. The second thing that scared me is the menu. There are four ramen dishes at ZuZu, and two of them are fusion dishes, heavily borrowing from Thai cuisine. That's not a big deal, I guess, as long as there is a traditional ramen dish on the menu, which there is, the "ZuZu Ramen." But what kind of ramen is that, exactly - is this shoyu (soy sauce) ramen or shio (salt) ramen? The menu doesn't say. The whole thing didn't seem kosher to me, so I never went - it's just too easy to hop on the subway and go to any of my favorite Manhattan ramen temples. BrooklynLady and I finally went to ZuZu Ramen, and I've been back twice since then. But here's the thing - there is literally only one thing on the menu that I will eat there, the house signature "ZuZu Ramen." The curly noodles are perfectly springy, there is deeply flavored broth that I don't think falls neatly into either the shoyu or the shio camp - it may instead be some sort of a paste that is mixed with dashi broth. The toppings are very nice too - lovely bamboo shoots, a single piece of crisp baby bok choy, scallions, a slow-cooked egg that runs happily into the broth, the obligatory sheet of nori (seaweed), and one very long, fatty, and completely satisfying slice of charshu (roast pork). This is a very good bowl of ramen, and the fact that it happens so close to my house is a great thing. There is really only one problem I can think of with this bowl - the price. It costs $14. That's Ippudo pricing, but this is not Ippudo. The rest of the food is just not so great. The "Tasty Morsels" are not very tasty. Pork buns a la David Chang taste more of smokey char than of sweet-porky-scallion-cucumber harmony, and pork dumplings just aren't porky enough and the wrappers have no flavor and a cardboard-like texture. But these dishes are tame anyway, they're not what gets you in the door. The adventure at ZuZu comes in the form of Green Curry-Miso Ramen and Hot and Sour Ramen with Shrimp. And neither or them work, even when suspending my purist's view of what ramen should be. We found Green Curry-Miso ramen to be unpalatable, and I love green curry, my favorite of the Thai curries. The broth here is simply overwhelming, though, the noodles and toppings cannot compete with the chili-lemongrass-kafir lime leaf intensity. It's war in a bowl, and it's just no fun. Hot and Sour Ramen is better, the broth more mellow, although it is definitely hot and sour, like Tom Yum soup in a Thai place. The problem here is the toppings - there are lots of small, tasteless, stringy, totally cheap shrimp. Save them, and give me one nice prawn, the way there is one slice of really nice charshu in the ZuZu ramen. There are also some little halved cherry tomatoes and big basil leaves, neither of which elevate the dish. Sounds like I hate the place, but I don't. I would go there happily, but for ZuZu Ramen only, and as a neighborhood option, not as a first choice for ramen. Here is a bottle that represents a lot of what I love about wine from the Loire Valley. It is absolutely delicious and easy to drink, although there is some complexity here too, it is robust and flavorful, but it compliments instead of overwhelms your dinner, and it has a definite sense of place, or terroir. And it is inexpensive, too - under $20. I'm not saying things are perfect in the Loire Valley when it comes to wine, far from it. For example. this wine used to be called Clos Delorme (as you'll see on the label in the photo), but importer JD Headrick said "the name recently changed from Clos Delorme to Claux Delorme because the French wine mafia determined that they didn't own a "real" clos and made them change the name." They clearly have their bureaucratic issues, too. 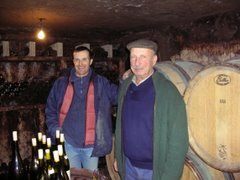 Claux Delorme proprietors Albane and Bertrand Michin run an eestate called La Tour Saint Martin in Menetou-Salon, a neighbor of Sancerre and Pouilly-Fumé. They bought a small amount of hillside land in Valençay, an obscure AOC to all but the most ardent of Loire Valley wine geeks, and they grow a variety of grapes that all go into one red wine. As in Cheverny, red wines from Valençay contain several grapes, typically some blend of Gamay, Pinot Noir, Malbec, Cabernet Franc. Each time I drink this wine, the thing that impresses me most is the skill in blending. The 2006 vintage is 40% Gamay, 30% Malbec, 20% Cabernet Franc, and 10% Pinot Noir. It is seamless wine - nothing sticks out, but the influence of each grape is clear. Importer JD Headrick said, "I take great pleasure in trying to identify the component parts. On a good day I can find it….the dark density that the Côt brings….the spiciness of the Pinot…the juicy "drink me" quality of the Gamay….and the earthy structure that the Cabernet Franc brings to the table." 2006 Albane & Bertrand Minchin Le Clos Delorme Valençay, $18, JD Headrick Selections. Dark purple to the core - looks like it's going to be one of those overly extracted, too intense wines, but it's nowhere close. A nose full of musky, meaty, dark black fruit, with a rich loamy soil character. Very energetic on the nose, and with some exposure to air there is a lovely core of fragrant violets. Completely smooth on the palate, finely grained tannins, fantastic acidity, very meaty and ample in the mouth, and perfectly balanced - the alcohol is a mere 12.5%. Again, with some air, the finish is quite long and takes on a nice smokey character. I would love to drink this with duck breast and confit, with any kind of pâte or charcuterie, alongside pasta with Brussels sprouts and bacon, or with a juicy hamburger. It would be pretty hard to go wrong pairing this wine - it might even do well with the famous goat cheese of Valençay (Valençay is the only place in France to have AOC status for both wine and cheese). The wine is great on its own, too. If I owned a restaurant or wine bar this would be on the list so fast, it would make your head spin.